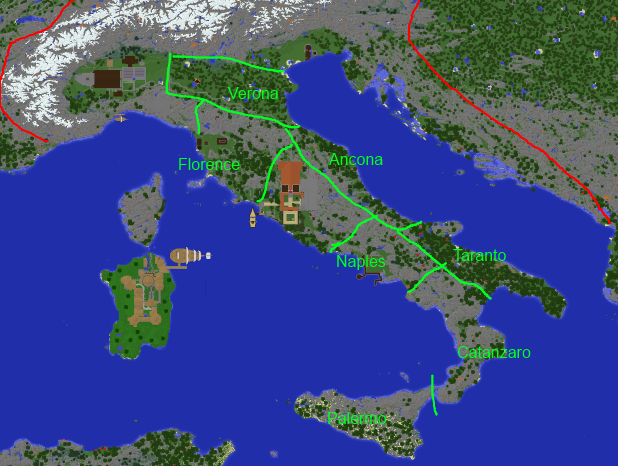 I play on a historical RPG-ish server based on a semi-accurate Europe map. I am currently the King of Italy, having recently reunited most of the peninsula with the exception of the Papal States in the middle who are my allies regardless. I'm looking for seven players with Towny experience, two to take over pre-existing towns with an inactive mayor, and the others to fill up some of my recently-conquered land. Age does not matter. You must have been a mayor of a town or nation before using the towny system. I would highly prefer to be able to speak to you over teamspeak beforehand. These are rough town borders based on the server dynmap. I don't really need people to be extremely active, just do some building and let new people in on occasion. The normal sort of thing. If you were looking for a new server to play on, consider this. All in all it is a very enjoyable server to play on; there is a bit of RP, a bit of building fun, and a bit of PvP. I think almost any sort could enjoy it. If you're interested, message me on these forums and I'll get back to you ASAP. Have towny leadership experience? I need you! Liked "The Art of War"? Sad it was taken down? Now you can read it again!